Nathan is ALL about breakables right now, in other words… Mommy’s precious things that are safely locked away in her curio cabinet. 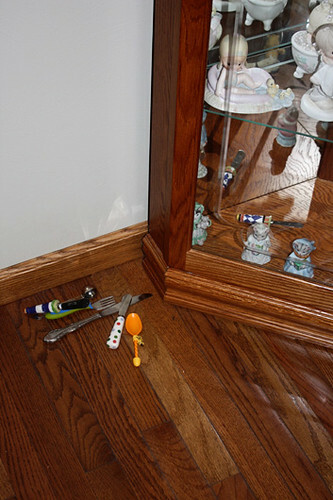 Well, well… SOMEONE tried very, very hard to get into my curio cabinet. Did he succeed? Yes, he did. See the lighthouse butter knife? Yes, he picked the lock to my curio cabinet with it.